I was appalled when I heard this panel suggest that women wait until 50 to have a mammogram. It is well-known that mammograms are the best way for early detection of breast cancer. The good news is that Sebelius is quickly backtracking on this ridiculous advice. The bad news is that Obamacare would implement it as policy. You've heard about those changing guidelines on breast cancer screening issued by a government advisory panel? 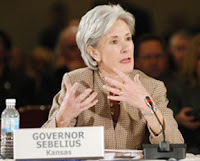 Never mind, said Health and Human Services Secretary Kathleen Sebelius on Wednesday. Amid an outcry from confused, angry women and physicians -- even the American Cancer Society objected to the changes -- Sebelius issued a statement Wednesday basically telling women to ignore what the U.S. Preventive Services Task Force had said. The USPSTF advises HHS, and its members are appointed by HHS. “There is no question that the U.S. Preventive Services Task Force Recommendations have caused a great deal of confusion and worry among women and their families across this country," Sebelius said on Wednesday. She said she wanted to address that confusion "head-on." "The U.S. Preventive Task Force is an outside independent panel of doctors and scientists who make recommendations. They do not set federal policy and they don’t determine what services are covered by the federal government.